This is the same exact outfit I'm wearing here. Only the sweater is different but you can't tell. I'm even wearing the same scarf. Didn't realize I chose the same scarf until I saw the older post. Looks like it is my outfit of choice for the day after a snow storm. I also wore it after a major snow storm the last time. I've worn the teal skinnies quite a few times. 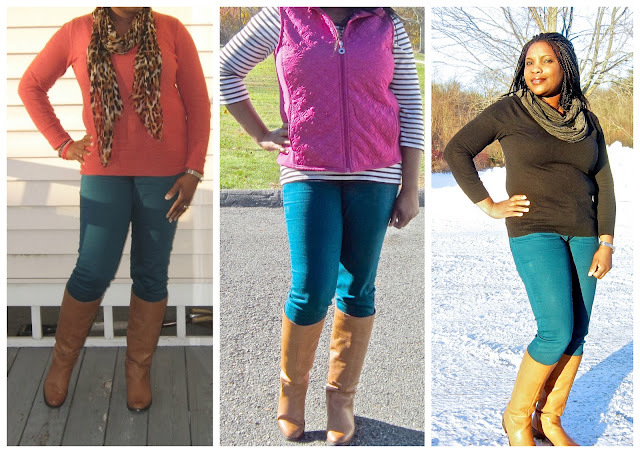 Below are other ways I've styled them and as you can see, I've worn the same cognac boots with all three looks. I guess I need a pair of black riding boots. I purchased two recently but returned them because they didn't work out. I'm thinking of trying these ones next. Isn't teal just so fun? Love what you did here! Great ways to style the teal skinnies! I really like them paired with the pink vest. Very nice new blog design too! I don't have any teal jeans, but I have bright green jeans, and I've been surprised by how truly versatile they are! I love your jeans - such a nice color!!!! Love your teal skinnies! Especially with the red sweater and leopard scarf.. perfection! Have a great day! That teal color makes me happy! This is making my want to buy teal jeans. You look fab! Hi, love your teal jeans and new 'do! I really need a pair of colored skinnies! Teal skinnies are the best!! Love the different ways you styled them! I love all 3 looks. The mix of colors go so well with each one. :) I see yaw'll got snow too... ugh, i'm so sick of winter. Teal is one of my favorite colors! You did great with all three looks - it's so versatile!! Nicely done! Teal is one of my favorite colors! You won't regret the black riding boots when you find the perfect pair! Love the teal skinnies!